Here’s the thing. The le sauce baking academy started because I can’t bake, am/was not a baker, and I wanted to learn. Non-bakers do not own big, powerful stand mixers. They work hard, hand whisking and beating where possible, and borrow electric hand mixers from their aunt when attempting to make a cake. But cake recipes basically warn you that using hand mixers takes, oh, 20x as long as using a stand mixer, so I’ll warn you of that as I was warned. I moved a new, strong electric hand mixer diligently across my batter for over 20 minutes and my egg whites still didn’t get as stiff as they should have before I gave up, so my cake didn’t rise as high as it should have. But it was still light, delicious and the quintessential cake. A chef friend of mine suggested that I start with génoise when I said I wanted to begin my foray into cakes with the classic version. 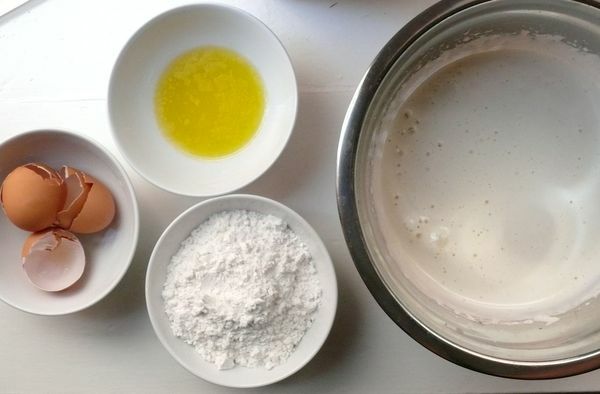 Provided you have a stand mixer, this recipe couldn’t be any easier. Four simple ingredients, the eggs being the only leavener, it could come together in a few, non-exhausting moments. It is still possible to use an electric hand mixer or just your own two arms since cakes were made for a million years before Kitchenaid was born. Just don’t give up as easily as I did, and even if you do, you won’t be disappointed. In the end, there will still be cake! If you have more cake experience than me (and that would be all of you), do share your wisdom and tips in the comments, and links to your best recipes on your own blogs. The le sauce baking academy is where we learn to do this together, remember. I’d love to see your best cakes and tips before September 6, when I’ll be back with more results from my cake trials and a new and very different cake recipe. If you try this génoise recipe, please let me know how you liked it or better yet, blog about it and leave us the link in the comments so we can see for ourselves. JP note: A stand mixer is almost essential for making this cake, because it takes about 30 minutes of beating by hand and almost 20 minutes with a handheld mixer to get the eggs to fluff up sufficiently. Make sure the eggs are warm–body temperature or so–before beating, or they will take twice as long to beat. 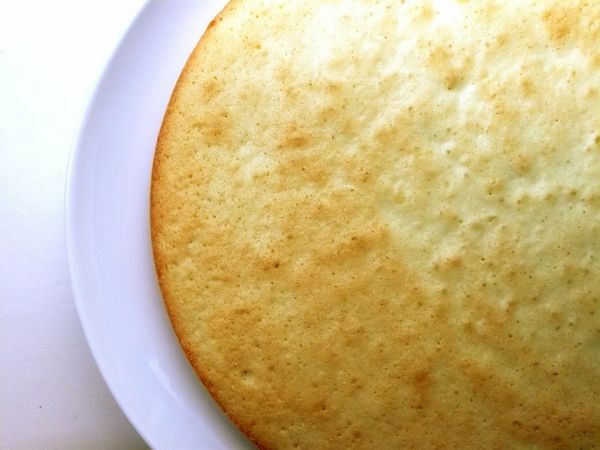 Preheat oven to 350 degrees F. Brush a 9-inch round cake pan with butter. Put a small amount of flour in the pan, tap the pan while rotating it at all angles to coat the bottom and sides completely, and tap out the excess. If you want to be certain the cake doesn’t stick–this cake rarely does–butter the pan, cover the bottom with a round of parchment paper, butter the parchment, and then coat the sides of the pan and parchment with flour, tapping out the excess. Crack the eggs into the mixer bowl, add the sugar, and beat at high speed to the ribbon stage: when the beater is lifted, the mixture falls in a wide band onto the surface, forming a figure eight that stays for 5 seconds before dissolving. This will take about 4 minutes with a stand mixer and 20 minutes with a handheld mixer. Transfer the mixture to a large bowl to make folding easier. Sift the flour over the egg mixture while folding it in with a rubber spatula. In a smaller bowl, fold together the melted butter and about 1/5 of the egg mixture, and then fold this mixture back into the egg mixture. 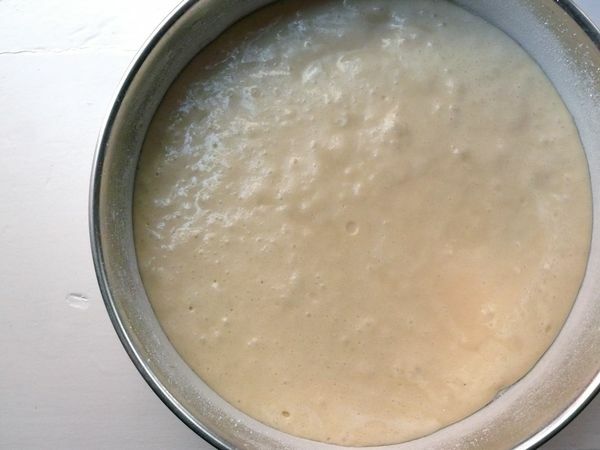 Transfer the batter to the prepared pan and gently smooth the top with an offset spatula. Bake for about 25 minutes, or until the top springs back when pressed with a fingertip and a toothpick inserted into the center comes out clean. Let cake cool in the mold until cool enough to handle and then turn out onto a cake rack. Peel away the parchment and let cool completely. Genoise is my favourite cake, especially soaked with a boozy syrup and cloaked in whipped cream. I make cakes a lot, but I never use my stand mixer. In fact I left it in storage when I moved. I use a hand mixer, but never for that long! My go-to recipe is Rose Levy Berenbaum’s from The Cake Bible. I’ll have to check and see if it’s on my blog. hi mary! im glad to hear you get by just find without a stand mixer, because i dont think ill ever own one. maybe i should try another recipe like the one you recommended, but still, not sure why mine took so long. the eggs were definitely room temperature. genoise with a BOOZY syrup–i should have thought of that!